NPCs: Lucien and Mudo: Morrigan's trusted demon servants, Decaya: A blind demon seer, Demitri: Lord of Vampires who is obsessed with Morrigan, Jedah: Untrusted demon who longs to control Makai, Q. Bee: Ruler of Soul Bees who only want to consume spirits, and various other Darkstalkers including Donovan, B.B. Hood, Victor, etc. The succubus Morrigan was adopted by Belial, King of Makai, at an early age. Even then, her powers were so great that they threatened to destroy her. To spare her that fate, Belial split her power into three pieces. One remained with her, the second with him, and the third was locked away in another dimension. Morrigan never wanted to become ruler, so she often neglected her duties in order to go to the human world to feed or just have fun. After her father's death, she was forced to be Queen, which she is still adapting to. 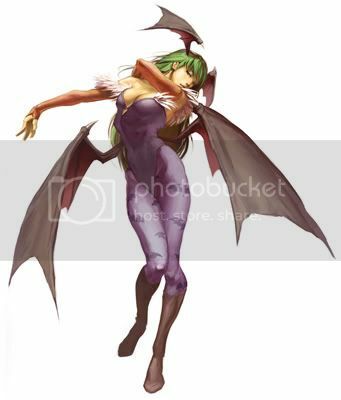 A recently discovered scroll prophesized that only Morrigan could save the Darkstalkers from the future leader of all the humans, who would kill every Darkstalker unless stopped. Now Morrigan, allied with Demitri, Jedah, and Q. Bee search for this human ruler in hopes of saving their kind. Morrigan can drain the soul essence out of any living creature. She uses this spirit energy to regain her strength, heal, and power her abilities such as her Soul Fist that is comprised completely of stolen spirit energy. She can also seduce any male of any species provided her will is stronger than theirs. As a demon she also has increased healing, strength, endurance, and reflexes, as well as the ability to fly. Morrigan is also an accomplished sorceress. She can use these feats to fire bolts or beams of energy, open portals, sense magic, throw curses or enchantments, or cast counterspells. She has recently gained the Code of Honor by absorbing the souls of the Knights of the Round. This ability allows her to nullify the powers of her opponent for a period of time. Lately Morrigan has been schooled in Illusions. She can currently cast a spell to Blind her opponents, lowering their accuracy while damaging them. Morrigan does not carry any equipment, but she does have a pair of wings attached to the small of her back that she can shape into various forms such as blades, shields, whips, chains, arms, etc.